What do we do in our academy sessions? We use lots of drama techniques within each session to allow students to become more confident with their acting ability. Using various methods of interacting with others, both on stage and in life, builds an individual’s awareness of oneself. In theatre, this skill helps actors relate to other characters within a production, which in turn develops a relationship with the audience. Performing on stage is not just about remembering lines or learning the lyrics to a song. It involves movement, characterisation, empathy, understanding, observation, experimentation and trust – it involves acting and acting is pretending. Children naturally pretend in the games they play without inhibition. They use characters to create stories in play, acting out scenarios and building narrative. They learn to communicate, to work together and above all, they have fun. JGDATA sessions are based on the belief that a student attending a session (regardless of age or ability) will, through a process of experimentation, revive the sense of wonder and magic that is innately ours as children. All too often an adult actor, can dissect and over analyse a part forgetting the fundamental notion of make believe, pretence and play. Through improvisation and experimentation, young actors begin to trust their natural instinct and have fun. Very soon the worry of making a mistake disappears and attempting a new challenge, whether successful or otherwise, is understood as a step forward. Here are some of the techniques JGDATA use . . .
Improvisation is the practice of acting, singing, talking and reacting, of making and creating, in the moment and in response to the stimulus of one's immediate environment and inner feelings or situation set by a director. This can result in the invention of new thought patterns, new practices, new structures, and new ways to act. Improvisation can be thought of as an "on the spot" or "off the cuff" spontaneous activity. The skills of improvisation can apply to many different abilities or forms of communication and expression across all areas of theatre. For example, improvisation can make a significant contribution in music, dance, presenting a speech, relationships, and much more. Techniques of improvisation are widely trained in the entertainment arts and JGDATA use this method in most sessions. The simple act of speaking requires a good deal of improvisation because the mind is addressing its own thought and creating its unrehearsed delivery in words, sounds and gestures, forming unpredictable statements that feed back into the thought process. Improvisation is great fun as it allows students to be anything, anywhere, with anyone at any time without knowing the outcome. ROLE ON THE WALL (or FLOOR) is a nice technique that JGDATA uses as a follow-up to role play or thought tracking. A large outline drawing of a character is pinned on the wall or laid on the floor (this could be the outline of a student). Students write words around the outline to show how the character is perceived by others. Students also write words inside the outline to show the character's inner feelings. This can lead to useful discussion of real and fictitious characters and helps understanding when trying to portray a character. Smaller figures can also be used and kept by each student as a way of remembering what was learned. PAIRED CONVERSATION is a method we use at JGDATA to build narrative and characterisation rather than a moving dramatic device. Students work in pairs, usually seated and without props. Like improvisation they hold a conversation, a discussion or debate. Students can be allocated roles or speak from opposing viewpoints, they may use characters or even pretend to be items, aliens or animals. The activity can be very useful in preparing ideas to be used in plays and is a very good tool for helping build scripts and persuasive writing tasks. MIME techniques and games can be used for many purposes. JGDATA knows that mime can help students focus on how to show emotions, character, situation and understanding. It is also a fantastic tool for descriptive writing and script creation. Mime can help students recognise similarities in patterns of movement - thus developing their use of simile and metaphor. It can also help students to develop simple physical mnemonics that can aid retention of information - from movement and dance to script and lyrics. HOT SEATING is an excellent way to think as a character. One student takes the role of a character from a story (or an historical figure, or the inhabitant of a foreign country, etc.) and sits in the hot seat to face questions from the rest of the group. Often it is appropriate to allow the hot-seater to prepare in advance, ready for acting in character and using the teacher in the hot seat to take on that role helps students to be more inventive with their questioning. On occasion it is good practice to use costume, especially if the student in the hot seat is a "baddy", it helps them to indicate that they are acting and answering in character. MODELLING is often used as a warm up tool, however JGDATA uses it in many other ways too. Here is how it's used: Working in small groups, one member of the group (the ‘sculptor’) arranges the other members to form a tableau (a still picture). This may be freeform or with a specific objective in mind (perhaps suggested by the teacher or another student). This can then lead to discussion of the role of each tableau member. This is also a great way to collect ideas for a production or to work on characterisation with individual students. There is an alternative way of using this technique too. The teacher may ‘sculpt’ a number of students into a tableau, which the rest of the class discusses (or guess), making suggestions for appropriate alterations etc. This is very useful for younger students to understand emotions, but helps all actors to share ideas and create narrative within a group. There is another way to use this technique which is especially good for younger students. The character’s conscience is the alley rather than the individual. This is also good if there are several options for the main character to consider, the activity could be adapted to bounce the thoughts off of the walls of the alley rather than aimed at the character. MIRRORING is quite a simple technique to encourage observation, concentration and physical expression. It is great for forming bonds on stage between actors and helps to promote collaboration. This is how it works: Students form pairs, face to face, one student takes the lead (by agreement) and performs a series of simple movements which their partner copies - as if in a mirror. This can also be used as a warm up or warm down exercise with the whole class mirroring the movements of the teacher. The teacher starts with a simple sequence of movements which is then repeated - with additional movements added. Gradually a lengthy sequence can be built up. This helps in lots of ways from developing memory skills, to building trust of another performer and even helps with group dynamic, getting to know others within the group by estimating their next move. 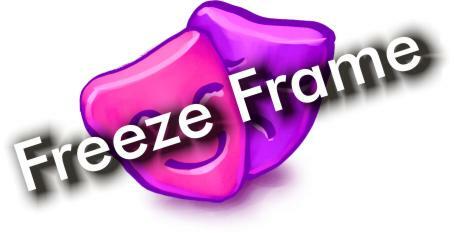 FREEZE FRAME is a drama device JGDATA uses in conjunction with improvisation and role play. Upon a given signal from the teacher (clap, bell, name etc. ), students "freeze" in position. This enables exploration of what characters may be thinking, which can inform the continuing action. Students are then given time to discuss how many frames are needed to tell a story, which could inform a subsequent piece of drama, or help with script creation. Another way this is used is to ask students to add a single phrase or word to the freeze frame, which encourages selective use of dialogue or mime. Freeze frame is also a good way of allowing others to build a picture or scene from within a group. SLOW MOTION is used as an extension to freeze frame. Students try to encapsulate a story or incident in as few frames as possible (perhaps before, during and after a dramatic moment). This can be used to provide the structure of a play or narrative to forming a new script. As the name suggests, it is also slows down the action, encouraging attention to detail and enabling more detailed analysis (especially of the feelings of the characters involved).